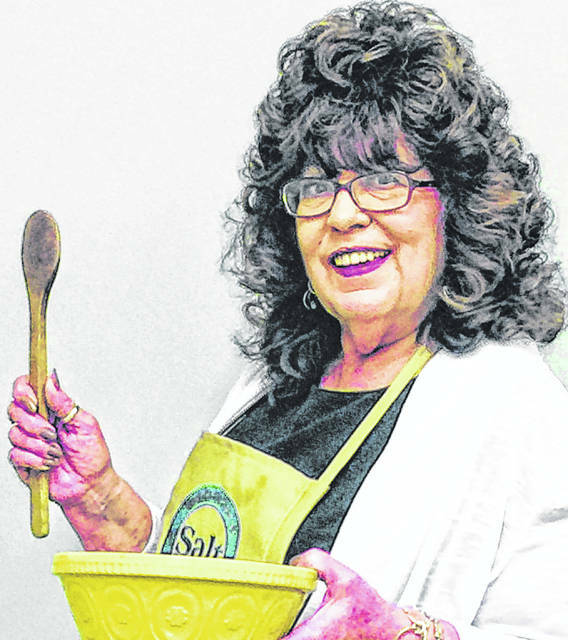 Rhonda Purdin’s No Bake Banana Split Dessert is shown in this picture. Hello! In the kitchen with Sharon this week is my friend and neighbor Rhonda Purdin sharing her No Bake Banana Split Dessert. Thank you so much, Rhonda, for sharing your recipe with all of us . Since I am your neighbor you need to make this for me. It looks delicious. This dessert was auctioned off at the annual Chili Supper and Dessert Auction benefitting the Highland County Society for Children and Adults. 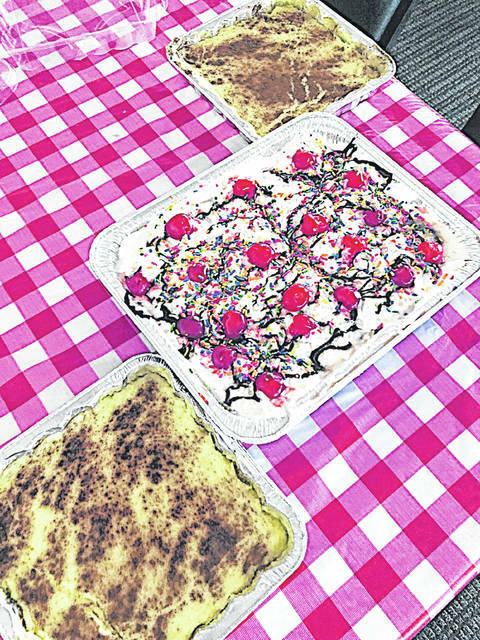 The two cheesecakes on the side were also auctioned, but the creator declined to share her recipe. If you want to submit a recipe, please call or email me and I will be glad to share it. 1. In a medium bowl, combine graham cracker crumbs and melted butter. 2. Firmly press into a crust in the bottom of a 9 x 13 glass or porcelain dish. Let it chill in the freezer for about 10 minutes to firm up. 3. In a medium bowl, cream together the cream cheese, 1/4 cups butter, and the powdered sugar until creamy, about 5 minutes. 4. Don’t be tempted to add milk. It will take a few minutes, but the mixture will blend up perfectly. 5. Spread the cream cheese mixture over the cooled graham cracker crust. 6. Add a layer of sliced bananas over the cream cheese mixture. 7. Spread pineapple chunks evenly over the bananas. 8. Even spread the Cool Whip over the pineapple/banana layer using a rubber spatula. 9. Garnish with walnuts/pecans and maraschino cherries. 10. Drizzle the chocolate fudge over the dessert and then sprinkle the rainbow sprinkles over the surface. 11. Chill for at least 4 hours before cutting to allow the layers to set.